If you haven’t heard of Ear Heart Music yet, you haven’t been living in New York. This monthly series continues to bring varied musical performances to the city’s ebullient and hungry multi-media landscape. Each evening touches upon different tastes or artistic interests, attracting familiar audience faces but always reaching yet another branch of the creative scene. In its April manifestation, EAM—in tandem with American Opera Projects—presented two bijoux operatic works at Brooklyn’s Roulette: The Wanton by Tarik O’Regan and Anna Rabinowitz, and The Companion by Robert Paterson and David Cote. The two scores were brought to life by the American Modern Ensemble, a group who make new classical music feel as catchy as this week’s Top 40. The evening brought together a bouquet of composers, singers, musicians, stage directors, and writers—not to mention all the tech gurus who sew together lights, visuals, and sounds from behind the scenes. Novelist A.M. Holmes, whose work bleeds into the worlds of visual art and television, refreshingly led the intermission panel between the key figures involved in realizing these mini-operas. This was a gratifying gesture toward opening up the less-explored paths that do exist (as I can personally attest) between the expressive goals of writing and music. The Wanton Sublime and The Companion (lasting about 35 and 45 minutes, respectively) were not only grippingly entertaining but proved that the small opera is gaining ground as a viable and truly accessible genre in itself. Think of it as a sort of music video born out of an ancestral Wagnerian opera tradition. Despite its brief duration, The Wanton Sublime threw itself into its monologue-story of a Virgin Mary figure. Singing while folding laundry in a drab blue maid’s outfit, mezzo-soprano Hai-Ting Chinn offered a fervid, piercing interpretation through dialogue that encapsulated the struggle over a woman’s forced identity in a male-driven society. The brevity also helped leave a stronger visual imprint of her expressive half hour. In The Companion, the style shifted into one of humorous repartee between a career-oriented woman and her robot lover (who in a 21st-century Coppelia twist, would eventually outgrow his software and become opinionated and irreverently human). Again, much of the triumph was in the punchy, not-a-moment-wasted aspect of its time allotment, creating a rhythm that held the audience transfixed. And with the American Modern Ensemble onstage, performing Paterson’s humorous, succinctly edited composition under the baton of Tyson Deaton, a special energy reverberated between singers and musicians—one that is less present when the latter are delegated to a cellar. 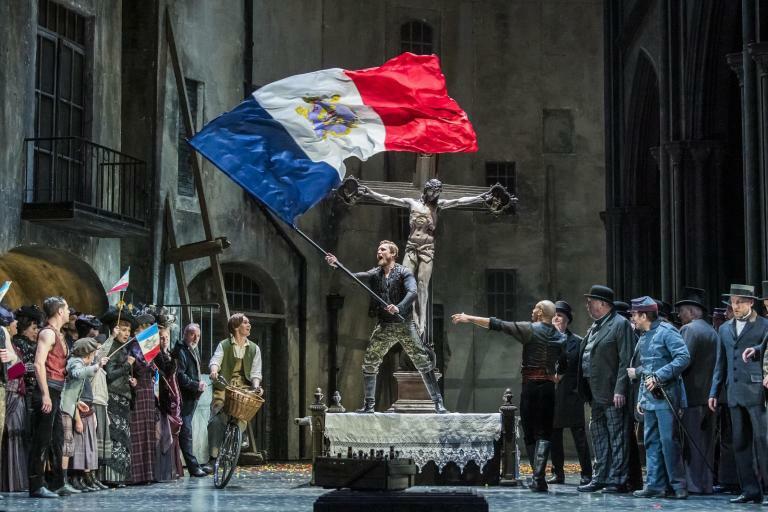 Well-directed, tightly composed, intensely acted, and precisely staged, these diminutive creations left nothing behind and didn’t induce nostalgia for a massive opera (which often, one might have wished had ended at least an hour earlier). Short does not mean shallow or hurriedly created. I won’t go as far as to say that “video killed the opera star,” but the petit opera is happily here to stay, with plenty of room to grow.